Chinese authorities are now exerting pressure on Christians in Hong Kong, the latest blow to freedoms in the city that has traditionally enjoyed some autonomy from the mainland, the New York Times reports. Mainland officials have told Hong Kong pastors such as Rev. Philip Woo that they are violating Chinese laws against religious training without permission. Mainland Chinese have also been prohibited from attending Christian gatherings in Hong Kong that police say would be "making trouble." In recent months, Chinese officials have barred mainland residents from attending some religious conferences in Hong Kong, increased oversight of mainland programs run by Hong Kong pastors, and issued warnings to outspoken leaders like Mr. Woo. "Many pastors are worried," said the Rev. Wu Chi-wai, executive director of Hong Kong Church Renewal Movement, a Christian group. "Some are reconsidering their work in the mainland." As a spiritual revival has swept through China in recent decades, the Communist Party, which is officially atheist, has generally grown more tolerant of people exercising their faith outside party-controlled churches and temples. Christianity is China’s fastest-growing religion, with at least 67 million followers, many of whom worship in independent, underground or unofficial churches, often with the acquiescence of the government. But [President] Xi [Jinping] has presided over a crackdown on civil society, with a focus on individuals and organizations with ties to foreigners, including lawyers, nonprofit groups and religious leaders. The party has long associated Christianity with subversive Western values, and over the past year, officials have accelerated efforts to demolish churches, shutter Christian schools, and remove crosses. 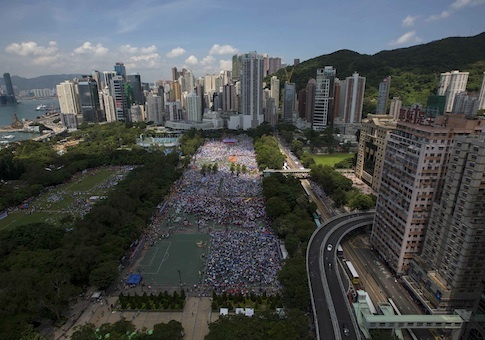 The Communist Party’s campaign against Christianity could prove to be a new flashpoint in China’s tense relations with Hong Kong. Tens of thousands of students and activists protested last year against Beijing’s plans for the city’s elections, which were described by critics as too tightly controlled by the party. A new national security law in China, denounced by activists, forbids "the exploitation of religion's name to conduct illegal and criminal activities that endanger national security, and opposes foreign influences’ interference with domestic religious affairs."